Blending psychology and observant wit with reportage, Sax argues for the limited appeal of the purely digital life–and the robust future of the real world outside it. ...[a] captivating new book ... Sax provides an insightful and entertaining account of this phenomenon, creating a powerful counternarrative to the techno-utopian belief that we would live in an ever-improving, all-digital world ... In these pages, Mr. Sax takes us on a spirited tour of the resurgent analog universe. So far most of the virtues Sax has listed for the analog world are private and personal—the rush of creativity (or really the rush of the possibility of creativity) that comes with buying a Moleskine, the slightly smug sense that your record collection somehow makes you a curator of your musical life. He’s on even stronger ground, I think, when he takes up the question of connection to other human beings ... Board games are the clunky polar opposite of the shiny digital experience. But Sax demonstrates that even as the Web has risen and the revenue from video games comes to rival the profits from movies, there’s also been a striking renaissance of people pushing little figurines around the tops of tables ... The notion of imagination and human connection as analog virtues comes across most powerfully in Sax’s discussion of education ... Why should efficiency be the standard measure, and not pleasure? I defy you to read Sax’s book without wanting to buy a Moleskine, put an LP record on a turntable, or play a game of Scrabble with your friends. It’s true that he mostly ignores some of the deepest questions raised by the digital age: the obsolescence of human labor against the tide of automation; the endless, uncheckable spread of surveillance. But the small rebellions he chronicles help us understand the general shape of a threat that goes beyond Karl Marx and his nineteenth-century complaints about capitalism; it’s in our digital era that all that was solid really did melt into air. No matter which side you’re on in the debate over digital technology, there’s something to cheer you in The Revenge of Analog. If you lament that the online revolution has wiped out the local, the tangible, the brick-and-mortar, David Sax’s chronicle of resurgent vinyl record factories and board-game cafes will reassure you with some of the niche businesses that have survived the digital onslaught. But if you think that Twitter and smartphones have brought us the best of all possible worlds, you’ll enjoy reading that many of these new, in-real-life innovations are actually enlivened by the web, like the blogs dedicated to Moleskine notebooks, which are thriving in an era of print nostalgia. 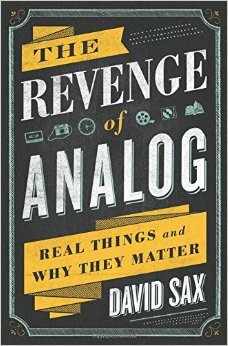 What did you think of The Revenge of Analog: Real Things and Why They Matter?